Stand alone halogen floods can be manually switched as required or can have an additional separately remote mounted sensor to control them individually or in multiples. These floods have a sensor integrated into the fitting itself (usually below) and on some models can be directed both horizontally and vertically. The sensing distance and angle of detection vary between fittings. 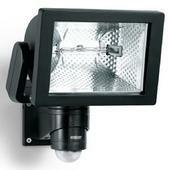 Some (not all) sensor floodlights can be manually over-ridden with a remote switch if required. Wireless technology allows a sensor to be placed well away from the floodlight without having to wire between the two. The flood has mains to it and the sensor is usually battery operated (very long life). There are also options to have wireless accessories such as alarms inside the building to give an alert when someone has triggered the PIR.